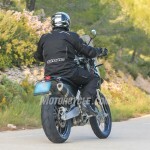 Back in March we MOronic soothsayers gazed into our crystal ball and prophesied the coming of a KTM Adventure model powered by the same 373cc Single found in the 390 Duke. 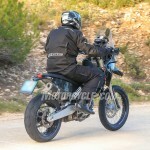 With spy photos of a diminutive Adventure-looking model from KTM now in our possession comes confirmation the price of our glass sphere was money well-spent. These unglamorous images reveal a model very early in its development stage: Exposed frame welds, zip-tied bodywork, and an information-gathering module in place of where actual gauges will eventually reside. We’re guessing it’ll be a 2018 model revealed at next year’s EICMA show, but even our crystal ball is unclear about that proclamation. 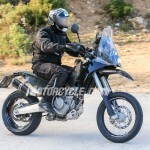 Earlier would be better, though, as the onslaught of 300cc-ish adventure bikes from Japan and Germany is already underway (BMW G310GS, Honda CRF250L Rally, Kawasaki Versys-X 300, Suzuki V-Strom 250). Wonky looking and clearly far from production-ready, the test mule seen here is obviously in information-gathering guise. 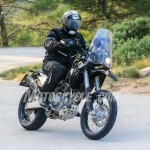 We’re seeing different engine cases than what’s currently housing the 390 Duke mill, so maybe there’s an engine surprise in the works, or perhaps a smoother-shifting transmission. 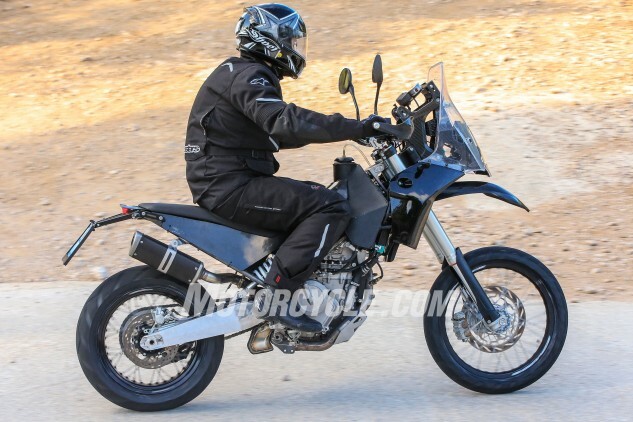 Wire wheels fit expectations, but the very-streetable rubber pictured will most likely be replaced with something more knobbyish, befitting a proper off-roader from KTM. 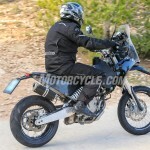 Outfitted with those tires it’s hard to say exactly what wheel sizes the KTM will roll on, but we expect either a 19-/17-inch front/rear combo or maybe 21-/18-inch wheels. 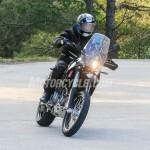 Suspension appears to be on the longer-travel side of what we’d expect of a beginner-type bike with seat-height concerns. 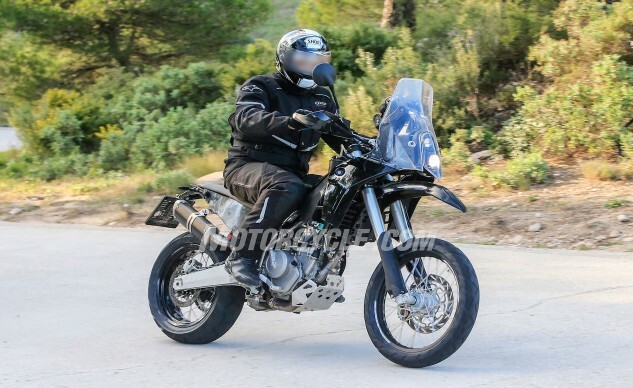 But that swingarm certainly isn’t from the 390 Duke and appears almost as if to be a temporary unit for possibly configuring a proper swingarm length. 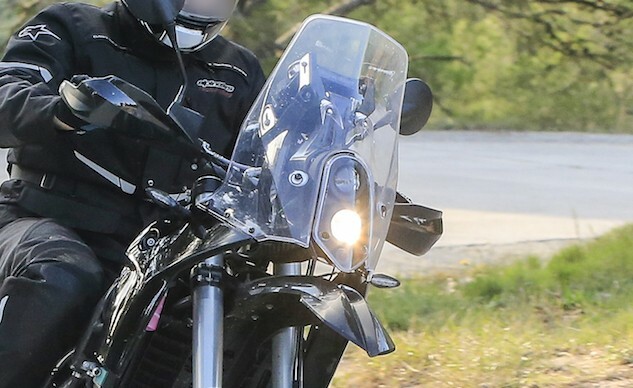 The headlight configuration and windscreen are reminiscent of the old 990 Adventure model making it likely that the face of the new 390 Adventure will be much different when the actual model arrives. Hopefully, it’ll retain the handguards and bash plate. The front and rear brakes are of the single-disc variety, but also appear different than what’s currently on the 390 Duke. At the rear brake is visible a wire most likely indicating ABS (mandatory in Europe), but don’t expect a price-conscious model such as this to be outfitted with other expensive electronic equipment like Cornering-ABS. Maybe a slipper clutch like the Duke. If, like the 390 Duke, KTM can bring the 390 Adventure to market at a relatively competitive price (2016 390 Duke $4,999), the bike will sure to be another win for the Austrian company. 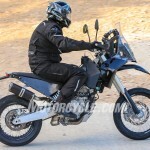 Like the 390, it likely will be built at KTM’s plant in India to keep costs down, so KTM should manage an MSRP close to that of Kawasaki’s Versys-X 300 ABS ($5,699) or Honda’s CRF250L Rally ($5,899). We’ll share more news when we get it. 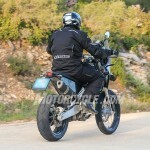 Meantime, expect to see a production version at next fall’s EICMA show in Milan.